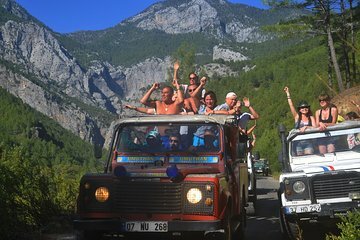 Explore the Taurus Mountains on a half-day Jeep tour from Alanya. Ride through villages and exotic fruit plantations, have lunch at a riverside restaurant, and visit a mosque. Your tour also has time for some thrilling off-road driving. After hotel pickup in Alanya, head to the Taurus mountains and experience rural life in Turkey. Visit different villages where locals serve you Turkish coffee and you can learn to prepare Turkish 'gozleme' pies. You can also try a water pipe, and stop into a mosque. Have lunch at a restaurant with scenic open-air terraces situated next to the Dim River. In the afternoon, you can swim in the cold river or try fishing for trout. Get great photo ops of the dam and lake nearby, and have the option to ride a camel (own expense) at the dam. Your tour ends with return to your Alanya hotel.